All right, everyone, October’s over. Clear out your pumpkin ‘ish and find a new fruit to obsess over. OK, you know I love pumpkin and am fine with them all fall long. But if you’re ready to move on to a new fall scent, Wen by Chaz Dean has a new collection of Fall Apple Spice that you may go gaga for. 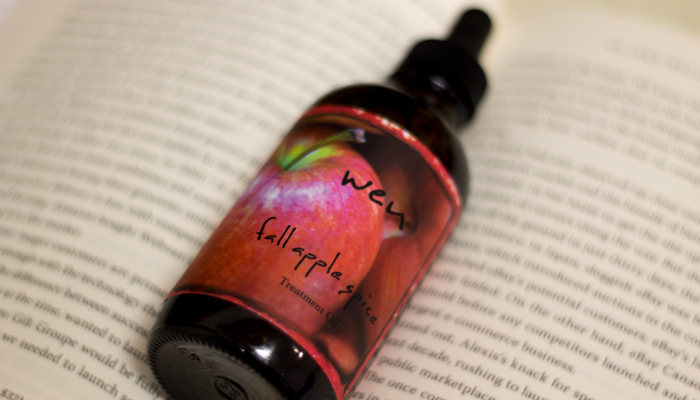 The Wen by Chaz Dean Fall Apple Spice Treatment Oil is a fragrant blend of warming oils — think clove, cinnamon and ginger — and the scent lingers all day, making this treatment oil (which can be used as a hair oil or body oil — I used it as a body oil) double as a perfume. The only questionable ingredient here is the “apple spice fragrance blend,” which is a proprietary, synthetic blend (I asked the company to verify). I’m guessing this is what keeps the scent around all day! It does make me a nervous, as this is the ever-popular “fragrance” that could mean anything … le sigh. If you’re easily disturbed by deep scents, this may not be the body oil for you. Like I said, it lasts all day — by 4 p.m. on a typical workday, the scent is going strong! I like the scent, but have realized I need to go easy on it when slapping it on as a body oil (I usually slather body oil all over my legs, chest and arms). It can be a bit overwhelming. It’s definitely not one I reach for on a daily basis. I need to be in a mood for this. That said, this is not on my repurchase list. If apple spice appeals to you, order your share by November 30! This limited edition scent will be gone after that. Have you tried anything from Wen by Chaz Dean? What fragrances are your favorite for fall/winter? Tell me in the comments section!